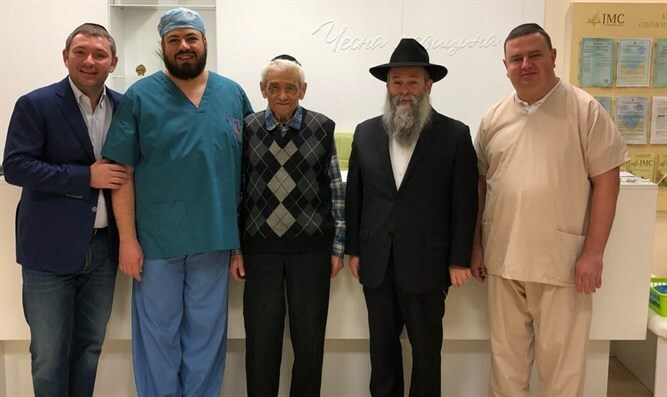 90-year-old Jew from Ukraine circumcised in special Jewish clinic in Dnepropetrovsk. Boris Neshderman, a 90-year-old Jew, was circumcised at the Menorah clinic in Dnepropetrovsk, Ukraine. The veteran rabbi of the city and Chabad emissary, Rabbi Shmuel Kamenetsky, told Arutz Sheva that the man is in good condition and is recovering from the operation. The brit milah was carried out by the chief mohel of Ukraine, Rabbi Yaacov Gaissinovitch. The Menorah clinic was established in the last year at the initiative of Rabbi Kamenetsky, who has worked in the city of Dnepropetrovsk for decades with the goal of bringing Jews from all over the country closer together. The clinic is used mainly by elderly Jews who have difficulty receiving treatment at the public clinics throughout Ukraine. The clinic has saved the lives of many Jews since it was opened. In a recent conversation with Arutz Sheva, Rabbi Kamenetsky explained why he established the medical center, saying, "Beyond my mission to spread Judaism, we are often involved in literally saving lives. Not a day goes by here without actually saving a life."